Matariki is Māori New Year, and is strongly associated with the celebration of harvest, of gifting food, and planning or preparing the ground for the new year's crops. It is a time to gather with whānau and friends and to reflect on what has been and what is yet to come. The appearance of the Matariki star cluster signals a time to start planning and preparing your spring garden. The star cluster is also known as the Seven Sisters or Pleiades. Some like to think of the seven-star cluster as the "mother" Matariki and her six daughters. Some iwi celebrate a different cluster of stars called Puanga or Puaka. The rise of all these clusters happens between late May and July, and the celebrations remain much the same. These stars are also recognised as a new-year marker and are celebrated in other Pacific nations. 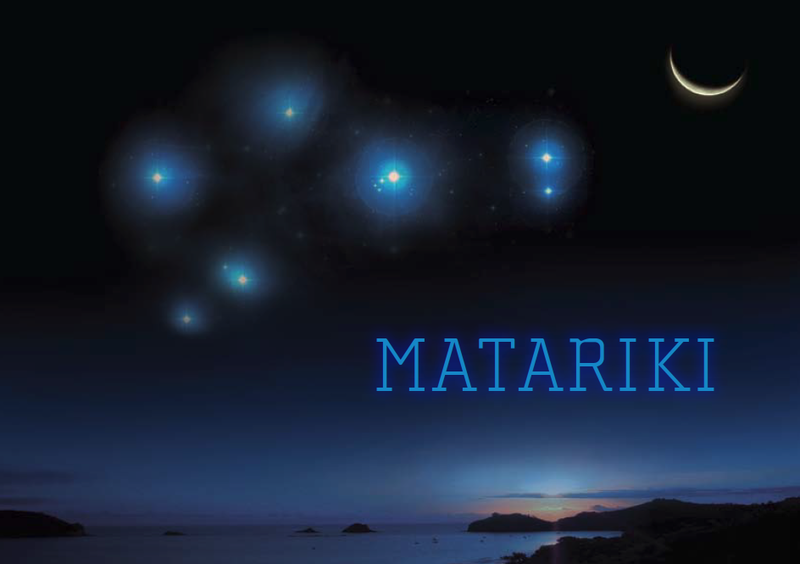 Matariki is the time to plan the Maori calendar (Maramataka). The calendar shows the ideal days for fishing, gardening and other practical food gathering or planning activities as well as the days to avoid certain activities. These are determined by the moon and the lunar cycle. Here is a look at a Maramataka taken from a 1918 book. The straight lines indicated good nights for line fishing, and black dots for fishing by torchlight. A night such as Whiro, with a dot and a line, was good for both. Matariki is a beautiful reminder of the importance of nurturing, respecting and restoring our environment. Share some of your home grown produce with family, whanau and friends. Lemons and other citrus fruit are in abundance at this time and with a long shelf life they are perfect to share, especially with those who don't have their own trees. If you have plenty of citrus ripening, make lemon curd or marmalade with tamariki mokopuna. Make a compost or a worm farm so you can recycle your uncooked food scraps into fertiliser for your garden. Plant blubs such as garlic cloves which will sprout after Winter. Add new fruit trees to your garden, perhaps something that will ripen this time next Matariki, such as a lemon, lime or mandarin. Here at The Little Digger Company, we'd love to give you a hand in the garden by offering you 50% off Auger hire during Matariki for the month of June. The auger attaches to The Little Digger and makes digging holes a breeze. Perfect for planting new trees, putting in posts for orchards, piles for houses or decks.